● Kevin Harvick started 13th and finished 31st. ● The No. 4 car had to go to the back of the field before the start and then serve a pit road pass-through penalty for failing prerace inspection three times. ● Harvick was in 32nd, one lap down, when the caution came out on lap 39. Harvick wanted to do the wave-around, but the lead-lap cars did not all come to pit road, so Harvick pitted for four tires, fuel and a chassis adjustment. ● On lap 60, Harvick pitted for four tires and fuel after saying he had a loose wheel. When he exited pit road he was 35th, four laps down. ● Harvick started 29th and finished 22nd. car was tight, but his lap times were good. ● Started 21st and finished 13th. ● No. 4 Hunt Brothers Pizza Ford Mustang pitted on lap 256 for four tires, fuel and a chassis and tire pressure adjustment. Harvick said his car was still tight. ● On lap 370 Harvick got by the leader and was one lap down. Unfortunately, he made slight contact with the wall, brought out a caution and went back down two laps. ● Harvick pitted on lap 379 for four tires, fuel and repairs to the damage from the wall contact. He restarted 21st, two laps down. ● On lap 435, Harvick pitted for four tires and fuel. He was 20th, one lap down. ● On lap 480, a caution came out and Harvick received the Lucky Dog to rejoin the lead lap. He pitted for four tires and fuel and restarted 17th. ● Under green for the final 14 laps, Harvick was able to gain four spots to finish 13th. ● Kyle Busch won the Food City 500 to score his 54th career Monster Energy NASCAR Cup Series victory, his series-leading third of the season and his eighth at Bristol. His margin of victory over second-place Kurt Busch was .722 of a second. ● There were 11 caution periods for a total of 77 laps. 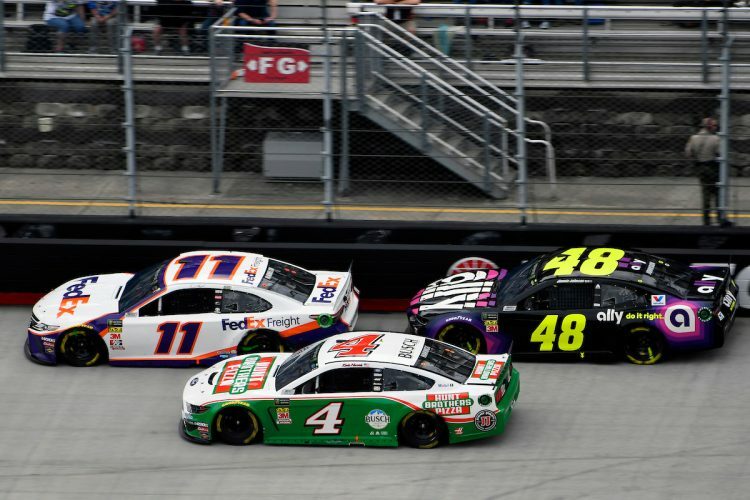 ● Only 16 of the 37 drivers in the Food City 500 finished on the lead lap. ● Kyle Busch leaves Bristol as the championship leader with a 27-point advantage over second-place Denny Hamlin. The next event on the Monster Energy NASCAR Cup Series schedule is the Richmond 400 on Saturday, April 13 at Richmond (Va.) Raceway. The race starts at 7:30 p.m. EDT with live coverage provided by FOX.